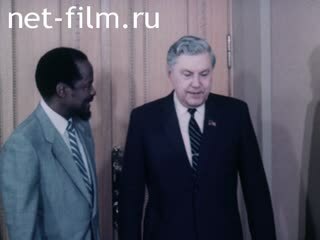 Operators: Izvekov V., Maksimov L.
About the visit of Joaquim Alberto Chissano, Chairman of "Frelimo" Party, President of the People's Republic of Mozambique, to the USSR in August of 1987. City of Moscow. August 3, 1987. Visiting President of the People's Republic of Mozambique, JA Chissano. Meeting at the Vnukovo airport. Atmosphere: Eduard A. Shevardnadze, Demichev, AF Dobrynin. Kremlin. Meeting with Mikhail Gorbachev, J. A. Chissano. Members of the Mozambican delegation talks with Soviet leaders. Soviet-Mozambican documents on bilateral cooperation. Meeting members of the delegation with the PN Demichev. Laying of wreaths by members of the delegation to the Lenin Mausoleum and the Tomb of the Unknown Soldier near the Kremlin wall. City of Kiev. Chatting in the Communist Party of Ukraine with leaders of the republic. Meeting with Chairman of the Presidium of the Supreme Council of Ukraine VS Shevchenko. Laying a wreath at the Monument of Eternal Glory. Visit the agro-industrial enterprise "Bortnichi" Boryspil district of Kyiv region, Kiev State University, the Central Museum. Lenin. Seeing in the Vnukovo airport. The visit to the USSR Chairman of the FRELIMO Party, President of Mozambique Joaquim Alberto Chissano, in August 1987.